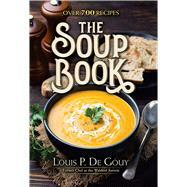 by De Gouy, Louis P.
Master Chef Louis P. De Gouy presents outstanding recipes for almost every soup you could want — more than seven hundred in all. Many are thick or thin, others hot or cold, taking hours to prepare or just minutes. They include soups that are perfect preludes for a feast, and inexpensive yet rich and hearty options that are meals in themselves. At the same time, the author teaches basic principles of successful preparation and offers many alternate recipes, giving cooks a wide range of flexibility. After an opening chapter explaining basic stocks and other fundamentals, Chef De Gouy introduces 61 different hot consommés; 65 chilled and jellied consommés and soups; 76 flavored by beer, fruit, nuts, or wine; 106 cream soups; thirty-three bisques; 100 chowders; and many others, including a special section of 117 easy-to-make recipes from combinations of various canned soups. Soups from many cultures and using almost every ingredient include chilled bortsch and vichyssoise, dark beer and bread soup, clam bisque, codfish chowder, Philadelphia pepper pot, and hundreds of others. Louis Pullig De Gouy (1876–1947) served as apprentice to his father, who was the Esquire of Cuisine at the courts of Austria and Belgium. Best known for his 30-year career at New York City's Waldorf Astoria, he was a founder of Gourmet magazine and the author of 16 cookbooks.